As mentioned in our previous post, sitelink extensions are one of the most powerful settings you can use to increase the CTR of your ads and save money from your AdWords campaign. However this is not the only extension Google makes available to the advertisers. In this chapter we will have a closer look to all the other extensions at your disposal to customise your business and stand out among your competitors. Before we start something important to remember is that your extensions will not show up all the time. They only show if your ad rank is high enough and the extensions are predicted to improve your performance. There are no extra cost associated to them. They are great features for local businesses since they show the physical address of a shop in Google maps and the distance to it. They are associated to your business information(listing set up) including opening hours and the phone number that people searching with a mobile can call. Location extensions work on the display network as well, they are shown to people who are near to your shop and have demonstrated interest in your business. These extensions help you to list the benefits of your business (ex. 24/7 support!, Free Delivery, etc. etc.). They are definitely a great help to target online shoppers and boost your conversions. You can add the extension at an account, campaign or ad group level. If you decide to use it at an ad group level, try to be as specific as possible with the unique offering of your product. Searches from mobile have boomed over the last few years. Having your number displayed and ready to be called in your ad is a must for your advertising campaign. Please be aware that including your business number elsewhere in the ad may lead to its disapproval. You also have the option to show the number during business hours only. These extensions create direct engagement with people looking for your product/service as it encourages users to send a message from your ad. A message icon will appear and when somebody taps on it, the conversation continues in the messaging app. There’s the option to create a pre-populated text in the app (for example a message to welcome your potential customers). It’s a setting which works only on phones capable of sending and receiving messages. You can set it up at an account, campaign, ad group or ad level. At the moment it’s only available for the search network. Through a predefined header, these extensions highlight the information your customers will find most valuable. Google has a list of predefinied headers that you can use. It’s important that your values match with the header otherwise Google will disapprove the ad. For best practice, the minimum number of values per header should be 4. These differ from “Callout extensions” which are used to highlight a unique aspect of your business, whereas a structured snippet is used for a group of products or services. You can add these extensions at an account, campaign and ad group level. They enrich the value of your text ads and give a more detailed showcase of different services and products. They help people to directly link to what they are interested in. They are displayed as a set of up to 8 cards which contain pricing and details of specific items. With no doubt this is one of the most powerful tools to increase your conversion rate. They work both on desktop and mobile and they can be set up on an account, campaign and ad group level. It’s also possible to schedule date and time of their appearance. If you are an app developer who wants to create brand awareness for your company and get more downloads from the same ad, then these extensions are the perfect solution. On the other side, If you are just looking to drive app downloads, you should focus on the app promotion ads. You can add these extensions at an account, campaign or ad group level. Detailed reporting on the number of clicks received on the ad and app downloads are provided. If you create the extensions for multiple app stores and devices (mobile+tablets) Google will smartly detect the kind of operational system used and the type of device in order to show or not the extensions. They are of a great help to find stores which sell your product. It’s a feature particularly indicated for big manufacturers which sell their products in big retail chains. It’s a very simple set-up as you only have to specify the stores where your product is sold and Google will do the rest. If you have a general promotion running in your store these extensions help your offer to stand out and favor the increase of your conversion rate. As you see from this post, extensions cover a wide range of functions and capabilities. From the emphasis of particular benefits of your business to the listing of pricing details of your products. Deciding which ones are most suitable for your needs requires an in depth analysis of your campaign objectives. 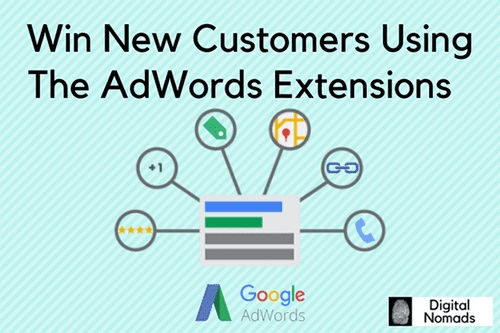 If used wisely, extensions can create a high level of engagement between your ads and the users which gives you the opportunity to find new customers. If you are still uncertain of which extensions can bring the highest return to your business, give us a buzz!